First the disclaimer : This is a long post and close to my heart. And I hope you find it as interesting to read as much as I loved to write it. Second the declaration : This was a post, to be up on 18th Sep, but due to reasons beyond my control, is on today under Alphabet O , although my fellow BMers at the Alphabet BM # 32 are dishing out stuff under the Quirky Alphabet Q which I am sure had many of us scouring hundreds of websites before settling on THE recipe for the day. O for Obbattu (ಒಬ್ಬಟ್ಟು). 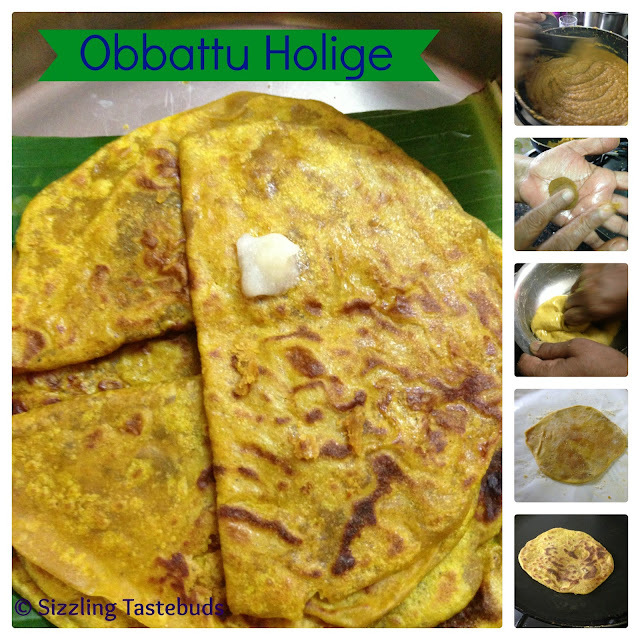 Obbattu is a thicker version of the Poli or stuffed bread with jaggery and coconut. The difference between Obbattu - a classic Mysore Karnataka dish - and Poli (with which it is generally compared), couldnt be more yawning than saying Chinese and Australians have the same genetic pool - I have nothing against either race, but the comparision is .... ummm... duh ! 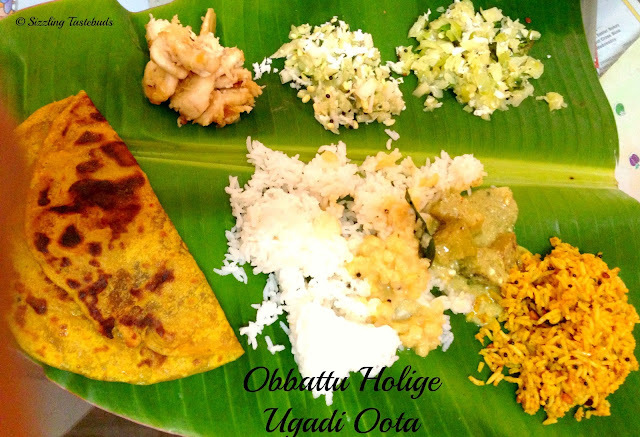 Festivals like Ugadi (Kannada / Telugu new year), Diwali and most celebrations at home were never complete with Obbattu , and Puliyogare (another classic iyengar dish). In that sense, for those from a TamBrahm background, these were like the creme brulee of Kannada cuisine. A thinner version of Obbattu with a maida covering and coconut-sugar filling is made, and called Holige (ಹೋಳಿಗೆ) although the names are interchangeably used. In a large bowl, sieve the flours and salt twice over. Add the fine sooji and mix well. Add turmeric and little water to make a smooth dough. Keep covered for 1- 1.5 hours.At the end of the resting / Soaking time, the dough should be stretchy without breaking, this is the test for the covering. Soak Dal for 1/2 hour. Bring 6-7 cups of water to a rolling boil, add the soaked and drained Channa Dal, turmeric and cook till the dal is cooked, and not mushy. If you were to press the dal between the thumb and the forefinger, it should be slightly soft, but still hold shape in the centre. This takes approx 25 mins. Drain and retain the water (yummy Obbattu saaru - or Obbattu Rasam is made out of the extract). Cool slightly & grind the dal along with the coconut to a smooth paste without adding ANY water. In a non stick pan, melt the grated jaggery add the coconut - dal paste. Cook till the mass comes to a thickish consistency, and you are able to pat a little pancake on your palms with a small portion. At this stage, the filling would leave the sides and turn to a thickish slightly dry mass rolling all over the pan without sticking. Add powdered elaichi and grated nutmeg to it and mix well. Cool and cover with a damp kitchen towel. Knead the outer covering well for 5 mins. Make equal portions of the stuffing. Grease a butter paper or banana leaf with generous oil. Pinch a small amount of the covering, and with the fingers, spread to a small disc, place the filling in the centre, and as with a modak, fold the dough over to cover the filling. Pinch out excess dough. Very gently with your fingers or lightly rolling with the rolling pin, flatten it out to a thickish disc, approx 8 inch in diamater. Take care that the filling does not come out. Serve hot with a dollop of ghee. Store between banana leaves in an airtight container - this keeps for upto a week under refrigeration. To reheat, just warm it on a tava for a min or microwave on a flat plate for 30 secs. looks so beautiful!! very well written post!! Obbattu sounds delicious . Is it similar to Poran Poli ? Seriously am drooling over that Ugadi thali, wat a spread, obbattu is just torturing me..i want some rite now. such an delicious spread :) and obbattu looks super yummy and perfectly made !! Loved reading the long post:)) it is commendable the way you are posting the recipes under one region...I am actually impressed.the polis look nice and interesting. hahah..you really do take a dig right..this is a lovely post..your spread looks very festive..nice to see the use of different lentil and flour..very nice..
Nice to read your long post Kalyani. Enjoyed it :).And this one has been on my list for a long long time. Your spread looks awesome.. Sorry Kalyani...I dont see much of a difference between boli (the thenga/parippu boli that my MIL makes) and this. Rava is a new thing, and she uses chana dal...but not much of a difference...Am I missing something? This what I like about our Indian cuisine. Recipes are almost similar with different names in differnt languages but each one feels theirs to be original and best. Gujaratis too make these with toor/toovar dal. Maharashtrians make with chana dal.